DEAR oh dear oh dear - those Gremlin people must be going for the nostalgian market with Impossamole. Either that, o they've got themselves badly caught in a time warp, because Impossamole is one Old Time Game. Labouring under the misapprehension that people ever liked Monty Mole to start with, Gremlin dug the little creature up again. Happily basking ona sun-drenched shore, The Mole with the Least is suddenly beamed aboard a passing spaceship, to be confronted by two alien beings. Instead of using the correct greeting for the situation (viz. "Eat Plutonum Death, you disgusting Alien Weirdos!") he is coerced into helping the being recover some lost scrolls (sacred) from the Five Guardians. He is given special powers, and set back to the Five Lands where the Five Grauniads live. Incidentally, none of this actually happens. You never see the spaceship, or the beings; all you see is a cartoon (static) of a flying mole in tights and sneakers. The one concession to progress (afer all, any machine could do the picture) is a technically competent House Track. And yes, it does have the irritating piano break that all House tracks have. To give the game even more nostalgia (or better, déjà vu, or better still, unoriginality) Monty must defeat each Guardian at the end of each level to gain a scroll, but this last Guardian can only be beaten once all the other scrolls have been recovered. 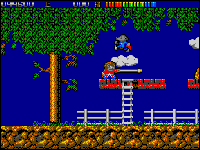 And the thing is, Impossamole, like all the Monty Mole games before it, is a twee little platform game. A well written platform game can be a thing of beauty and a joy forever. IT should have pixel-perfect positioning, keyboard controls (for the ultimate accuracy), high contrast between the player and the background, three (or five) lives, and th bits that are nasty to stand on should be immediately recognisable as such. That's the trouble with these new machines. The sprites have so many frames that you can't tell the difference between a super mega hyper Big Leggy jump, and an adequate mega hyper Big Leggy Jump (something to do with Hayzee Fantayzee?). There are so many colours that graphics people put nice smooth edges around sprites so you can't tell when tehre's a collision. Bah - bring back monochrome sprites and dot - crawl, I say. Each of the worlds has a theme: one is mine, another is the Orient (keep those Origami ducks off me! ), yet another is the jungle (would credit it, a 'nana-lobbing Gorilla?) and the last one is Arctic-ish. There is a fifth, but it is reserved for people who have completed the other four. As you only have energy, rather than good old fashioned 'lives', you have to be some mean übermansch to manage it. Either that, or very desperate. Remember the cute little "Please Wait..." that you used to get with all games? Well, Gremlin have given you the wait while levels load in, but haven't given you the message. What they have done is given you a loader that punishes the drive into eldritch gritchings, and does funny things with the serial port, and gives you nothing but blackness to look at in between levels. C'mon people, what ever happened to the art of the loading screen? What I find particularly amusing in this game is that one of Monty Mole's "power-ups" is a can of worms. Sums up the game quite nicely, I think. The animal with the vision problems is back and this time he has brought an extra eight bits with him. Monty Mole has finally found his way over to the big boys. Although the game itself has not been out on the Amiga, the feel certainly has. You have to horizontally scroll your way through four scenes - the Klondike, the Orient, the Amazon and Ice World - before qualifying for the final level. The main obstacles in your path are beasties who you may be forced to duff up. With a lot of beasties - the grey birds in the Klondike (they might be bats) or the puffins in Iceworld (!) - there is little point in attempting to ruck them unless you have picked up some additional weaponry along the way. Your best bet is to spread your cape (they have given Monty a cape) and attempt to jump, fall or fly over attackers. Jumping and falling, you ask? There is a glut of it. Most of your time is spent off ground, mainly because many of the surfaces upon which you might land are treacherous in the extreme: moving rocks, sinking rocks, nasty oozey chemical-looking gunge and spears which do to a mole that which was done to Perkin Warbeck (he was lowered onto a red hot poker so that... you get the idea). Once you have sorted out the jumping then you have got plenty of bits 'n' bobs to pick up along the way. Because you play the game with one life, but are capable of taking several hits, you should keep your eyes out for some life-sustaining food. This comes in the form of worms, ice creams and other nosh (now normally opening a can of worms is the last thing you would want to do but there you have it... a funny old game). Also, be on the lookout for jewels, lumps of gold, coins and anything else dosh-like which might come in handy if you have occasion to meet a shopkeeper along the way. After making your way through the initial four scenes and biffing the end-of-level guardians you get a crack at the Bermuda Triangle - to win this you have to sing it better than Barry Manilow. No, seriously, if you have the patience to achieve the feat then it is Bermuda ahoy. Graphically, Impossamole does its duty with no real quibbles to be had. It is certainly not up to the "Crivvens look at that for some mind bending imagery!" standard, but who needs their minds bent when you have got small bear-chested chappies with attitudes bearing down on you? The backgrounds themselves are fine: nothing to complain about or to get overly excited about, for that matter. There are the occasional perspective changes in the form of trees and spears going behind then in front of you - jolly stuff but nothing to get agitated over. Monty himself is drawn with what an art critic might say was a "sympathetically cartoonesque style" - in other words he is cute as a box of two-week-old kittens in soft focus. The soundtrack changes from an introductory drum machine, scratch and stiff blast to a weirdly lilting game tune. Of course, if it is not your bag there is always the Walkman. Monty's death throes, it must be said, sound less like the passing of a hero and more like the final moans of a prima-ballerina. How do I put this? Not very much, really. Although the gameplay is standard stuff, it lacks the thought required by something like Rick Dangerous. After a while you will find yourself blasting through creatures purely to get to the end of the screen and not really caring whether or not you make it just as long as you can say that you have seen the end. This stream of impatience is added to by the fact that the death of the mole finds you twiddling your thumbs or making three cups of coffee while the game gets itself together once again. This does nothing whatsoever for the concentration and peps up the irritancy factor eleventy-five percent. The loading screens are blank, grey areas with nothing to keep you amused. All in all, a game for they young at heart and patient of nature. There is lots to do and little thought required to it. It does not take too long to suss out who can and who cannot be beaten to pulp with ease. The additional weaponry which you change upon every so often seems to have a life span close to that of a mayfly at a frogs' convention. One of those game which you might play from time to time just to see, but not one which you would rummage through your collection for. A nice effort, a cute character and some passable gameplay. Kein anderer Computerheld hat soviele Bildschirmauftritte aufzuweisen wie er: Fünf Spiele mit dem kleinen Maulwurf Monty sind während der letzten sieben Jahre erschienen! Eigentlich hieß es ha schon 1987 "Auf Wiedersehen Monty", aber wegen der großen Erfolgs gibt es doch noch eine Zugabe. Der tierische Held muß sich mal wieder durch eine Welt voller Plattformen und Gegner kämpfen, wobei pixelgenaues Springen oberstes Gebot ist. Mony ist diesmal bewaffnet, sein Arsenal reicht von Bomben bis zum Raketenwerfer. Die Waffen hat er auch bitter nötig, denn die fünf Level sind nicht nur sehr lang, sondern auch gefährlich. Jeder hat ein eigenes Thema, der erste spielt z.B. in einer Mine, der zweite in einer orientalisch angehauchten Umgebung. Die einzelnen Spielstufen können direkt angewählt werden - außer der letzten! Geld ist mittlerweile auch ins Spiel gekommen, für aufgesammelte Münzen kann man den kleinen Wühler in Shops mit feinen Extras ausrüsten (sehr wichtig bei so vielen Gegnern!). Nur: Alle Waffen sind zeitlich begrenzt, es ist also ein besonders flinker Ballerfinger gefragt. Spezialität: Die Anleitung ist deutsch aber etwas spärlich. Monty Mole has been making money for Gremlin for some time. He appeared in Wanted: Monty Mole in 1984 which raised some eyebrows for reflecting on the miners' strike. Three releases later and Monty retired in 1987 with the game Auf Wiedersehen Monty. Now, like all "retired" superstars Moty is making a comeback - resplendent in his supermole outfit and newly found superpowers. Juggling your joystick around will load the game while Benn Daglish's music is played. It is superb, which is quite an advantage as each game can take ages to get into. There are five levels to Impossamole. You can choose the order in which you tackle the first four - The Klondike Mines, Oriental World, a Jungle and an Ice World - but the fifth level, The Bermuda Triangle, can only be accessed after completing these four. So how do you progress? Combat involves either Monty using his super powers to kick his aggressors to oblivion or collecting weapons along the way - bombs, guns and even the odd plasma bazooka can all be picked up, even if they all only last for a short time. The weapons are far less effective than you might expect. If I came face to face with a megalomaniac mole training a bazooka at me, I would not expect him to have use more than one shot to turn me into worm fodder. Unfortunately, this is not the case in this game which begins so ridiculously difficult that only the most determined will persevere. This blemishes a superb game. The graphics are beautiful and the characterisation is great, but the difficulty of play and the time taken to restart make the Impossamole annoying in the extreme. Monty Mole has come out of retirement! Our furry friend has had some interesting adventures in the past, doing coaled turkey for his thieving exploits before escaping to Europe where he 'found' enough money to buy the island of Montos. But lying in a deckchair wasn't Monty's style; once again he longed for the excitement of adventure. It was perhaps just as well then that a passing alien decided to beam him up for a new mission! Apparently the aliens' sacred scrolls of eternal life have been stolen by five Guardians. Each of these is hiding at the end of one of five levels, ranging from the homely mines of the Klondike to the mysterious Orient. Each level comprises several layered, horizontally scrolling sections linked by chasms, ropes and ladders. Of course, they are also inhabited by plenty of evil minions which reduce Monty's energy on contact. Mind you, Monty has now developed a powerful kick which can boot the weaker nasties into touch. And by picking up treasure he can get powerful weapons like bombs or even a laser gun. He's also stars with a super weapon (smart bomb) although this can be used once. The first four levels can be attempted in any order, but all four must be completed to allow access to the final one. The title of Monty's latest adventure is certainly appropriate; I found it impossible to get very far. Just one mistake can cost a huge amount of energy and with only one life things can get more than a bit frustrating. The platforms-and-ladders action isn't exactly innovative, although there are some nice touches with each level having appropriate nasties and features, e.g. snowmen, huge rolling snowballs, and cable cars in 'Iceland'. These don't just add graphical variety but make each level different to play. Pity it's just a shade too difficult for my liking. The Amiga game is equally tough and nothing special to look at with typically cutesy sprites gracing adequate backdrops. But by far the worst feature is the irritatingly lengthy and frequent disk accessing (on starting a game, and dying). Like so many comebacks Monty's proves disappointing. A good dose of nostalgia came with this game. A pity the latest instalment just doesn't have much in the way of a thrill factor, the game ideas have undergone very little improvement over the originals of years back. I'm sure Core Design have original ideas coming out of their ears but Impossamole just didn't have the pace or depth to keep me hooked. It's got good variety with the five worlds proving significantly different to give it some short-term appeal. Unfortunately the on-life only 'feature' discourages further progress as it's a tough game of limited innovation. The C64 version comes off quite a bit better with nice shading and good recreations of the 16-bit graphics; also the multiload is a lot more intelligent. 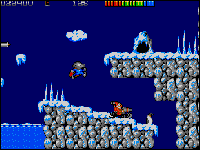 The Amiga game certainly has a finer edge to the graphics and the cartoon feel of it all works better. Not too sure about remixing an old Mole tune though, isn't this supposed to be the new adventures of Mr Mole? Multiloaded levels, but good option to play any of the first four. A good variety of creatures and enemies, totally different for each level. Ear-wrenching remix of an old tune which can be swapped for sparse FX. Tough to start but frustration is avoided by choice of levels. Challenging, perhaps a bit too tough. Fairly standard arcade adventuring action. 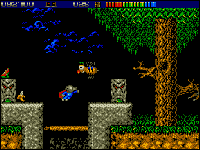 Choice of four starting levels. Appallingly lengthy disk access. Good variety of cartoonesque sprites. Not particularly addictive but choice of levels offers instant variety. Far too tough to be enjoyable.